Wonderful patio set designed and forged by a master artisan. Solid, well-grounded, with a quirky flair. We can't help it -- the contemporary feel and curved details in this wrought iron ensemble remind us of the whimsical lyricism of the art of Henri Mattisse. So, yes, these pieces may make your Mexico guests feel like dancing. We certainly hope so! 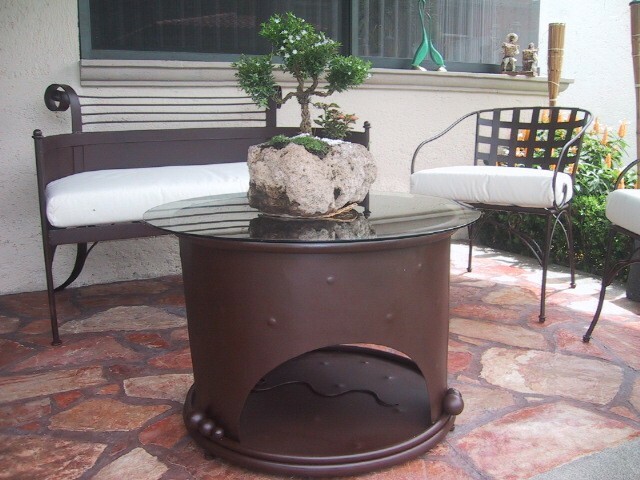 These are wonderful furniture pieces designed and forged by a master artisan. They are solid and well-grounded, as well as having an element of quirky flair. Your Mattisse Patio set includes: Fire pit-style table, upholstered bench and three (3) chairs with cushions.